Sarah at Crooked Lane Books invited me to take part in the Blog Tour for Little Darlings, and because I enjoyed The Psychology of Time Travel (also published by Crooked Lane Books) I gladly accepted the offer. Here’s my spoiler-free review for one of the best thrillers I’ve ever read. I’d like to start by talking about the child-birth scene because I feel like this needs a trigger warning for mothers who’ve had an intense or scary child-birth, and pregnant women or new moms. My first birth was similar to the one in this story and I had a really hard time reading it. 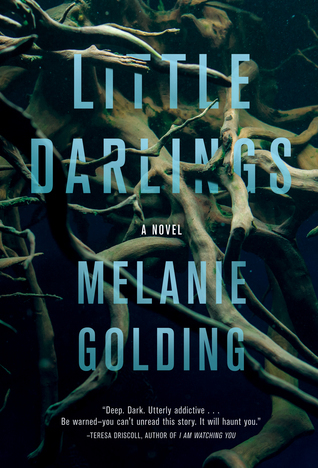 I’m glad I pushed through because Little Darlings is honestly one of the best thrillers I’ve ever read in my entire life. I don’t often re-read books but this is one I definitely want to read again at some point. Inspired by the Welsh fairy tale called The Brewery of Eggshells, Little Darlings takes place in Peak District, UK. Patrick and Lauren are expecting twin boys. After a difficult childbirth, Lauren is alone in the hospital room when a disheveled woman visits her. The woman is singing creepy songs and attempts to abduct Lauren’s babies. When DS Jo Harper arrives at work the next morning she sees the emergency call made by Lauren on the list of closed cases from the night before. Acting on a hunch, Harper visits Lauren in hospital, and although the hospital nurses and doctors have said that Lauren was hallucinating, the detective believes Lauren’s story. Against her supervisor’s wishes, Jo acquires the CCTV footage of the hospital hallway outside Lauren’s room. At the time of Lauren’s 999 call there are strange shadows on the floor of the video. Her boss won’t allow Jo to send the tape for further scrutiny, claiming that the case was already picked up by the mental health workers at the hospital. No one believes Lauren, and she accepts the fact that she must have hallucinated…Until…she’s at home adjusting to motherhood when she sees the creepy woman in the bushes across the street. Patrick says he doesn’t see anyone, Lauren calls Jo, who finds the ground next to the bush is trampled. Again, she believes Lauren and becomes suspicious of Patrick. With the help of a journalist named Amy (who she has a crush on), Harper continues her investigation into Lauren’s case, while Lauren becomes increasingly paranoid. She feels resentment towards Patrick for not helping with the babies, and is suffering from lack of sleep, fear, and anxiety. After an incident while out for a walk, Lauren believes the creepy woman has taken her twin boys and replaced them with changelings, who look exactly like her babies but who act very strange when no one else is looking. I despised Lauren’s husband Patrick for most of the book. He’s incredibly selfish, and manipulative. Lauren’s thoughts and actions are authentic, and as a mom I could relate to her intense fear. Her description of the changelings gave me goosebumps, and at one point had to book the book down while reading before bed because it was creeping me out. The writing style is a five-sense experience. The pacing is perfect. I honestly couldn’t stop reading this. Little Darlings is an atmospheric, disturbing psychological thriller about the fear we share towards the unknown. Film rights are optioned by Free Range Films, and I’m crossing my fingers that I’ll get to see this on the big screen. Love books? Get your next read for 50-90% off list price, plus get $10 off your first $25+ order at Book Outlet. Thank you to Melanie Golding and Crooked Lane Books for the complimentary copy in exchange for my honest review.